“Lamb to the Slaughter” was an episode on the Alfred Hitchcock Presents television anthology series (Season 3, Episode 28) that was scripted by Roald Dahl and based on his famous 1953 short story of the same name . Like many of Dahl’s tales, this one is a black-comedy with a macabre twist at the end, which fits right in with the general tenor of the Alfred Hitchcock Presents series. Also in line with a general Hitchcockian theme is Dahl’s focus here on guilt. Western culture is obsessed with guilt, inasmuch as a good part of it is derived from the Abrahamic religions, for which guilt is a major concern. So our cultures have developed many social institutions, such as the police and judicial systems, for the assessment and identification of guilt. 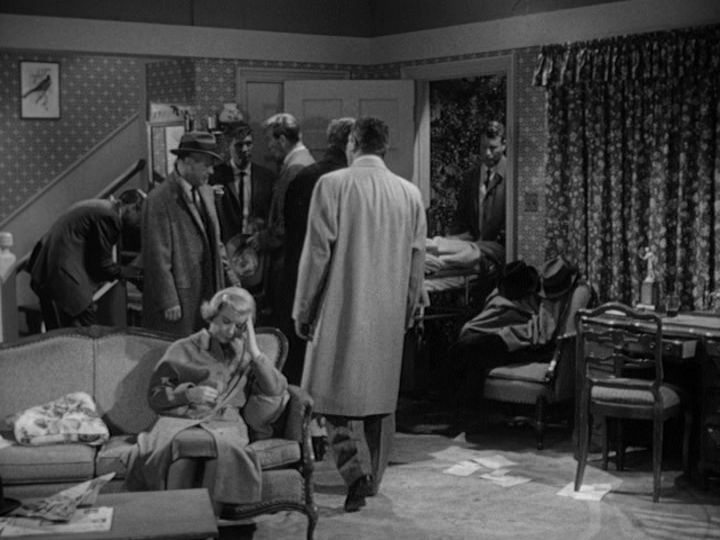 Hitchcock was particularly concerned in portraying the paranoia-inducing effects associated with situations in which these mechanically-based institutional assessments of guilt go awry, and the wrong identification of guilt is made, such as in his film The Wrong Man (1956). This is what also happens in “Lamb to the Slaughter” but in an ironic way. 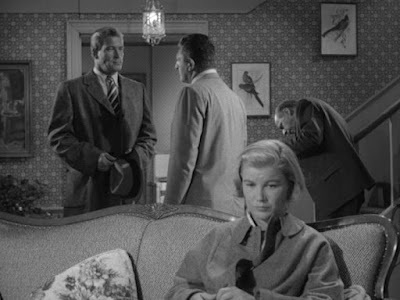 This episode benefits from the presence of two veteran character actors – Barbara Bel Geddes and Harold J. Stone. Barbara Bel Geddes’s long career on the stage and screen often had her an portraying ordinary homespun woman, as she does here, with whom viewers can identify, and she played a similar role that year in Hitchcock’s Vertigo (1958). She is the main focus of this episode. Harold J. Stone, a long-time TV character actor, plays a dedicated police detective, much like the similar role he played in The Wrong Man. The story of “Lamb to the Slaughter” comprises two parts – the crime and the police investigation.. 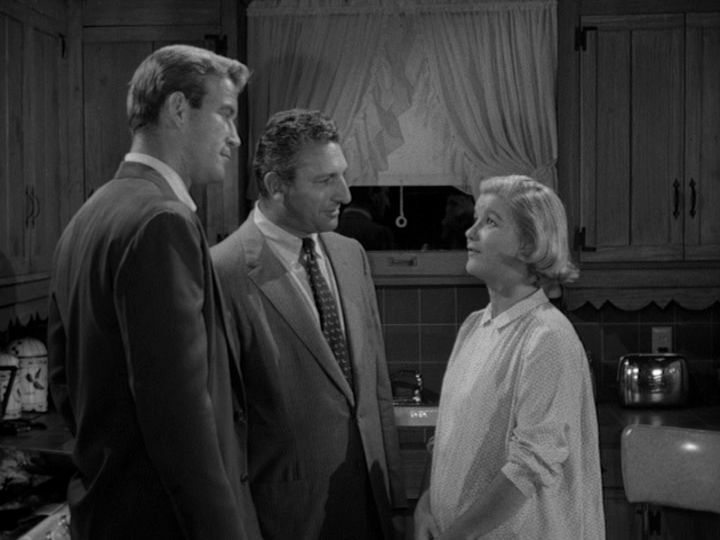 The opening scene shows dedicated and pregnant housewife Mary Maloney (played by Barbara Bel Geddes) lovingly kissing her policeman husband Patrick when he returns home from work. 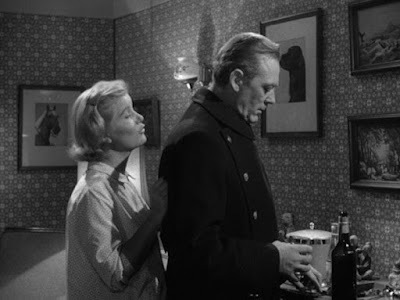 But her husband brusquely turns away and coldly announces to her that he is immediately leaving her for another woman and that he wants a divorce. Mary is stunned by this news, and in a daze she staggers back into the kitchen to continue her housewifely duties of preparing dinner for him. After withdrawing a large frozen leg of lamb from their freezer, she calls out to him that she won’t let him leaver her. “Try and stop me,” he tells her with his back turned to her while fixing a stiff drink for himself in the living room. Still stunned, Mary comes into the living room and in an impulsive act of blind rage, hits her husband over the back of the head with the frozen leg of lamb she is still absent-mindedly holding. The severe blow fractures Patrick’s skull and immediately kills him. Still in a daze, Mary walks back into the kitchen and almost mindlessly places the frozen leg of lamb into the oven and turns it on. Then she sits down at the kitchen table and begins pondering what has just happened. At this just point we see a change come over Mary’s face. She shifts from being the innocent, abused housewife to being a person trying to figure out what to do with the situation she now finds herself in. She gets up and strews rubbish and overturns furniture around Patrick’s corpse in the living room. Then she goes out for a brief shopping visit to the local grocery store. When she returns home, she calls the police and informs them that her husband was murdered while she was out. The police, led by Lieutenant Jack Noonan (Harold J. Stone), arrive and begin a thorough investigation of the crime scene. The police investigators, accompanied by a doctor, are meticulous in recording all the details, as they take fingerprints everywhere and look for every last clue. This is where the dramatic tension tightens further, as the rigorously thorough police seem to be (to the viewer’s eyes) closing in on Mary. They quickly conclude that the appearance of a struggle prior to the murder was artificially staged and that an unsuspecting Patrick must have been murdered suddenly by an acquaintance. But the one thing they can’t find is the murder weapon, which they are sure must have been a blunt club-like instrument. Under all this scrutiny, Mary’s position seems increasingly shaky. But her innocent and wounded demeanor puts her beyond the suspicions of the careful and civilized police investigators. They inform Mary that they will be spending the entire night at her home investigating the premises in further detail in the hopes of finding that missing murder weapon. Mary tells the men, who she cordially acknowledges are all her husband’s former colleagues, that they should eat the leg of lamb which has been cooked in the oven and is now ready to eat. It will just have to be thrown out if they don’t eat it, she tells them. The police all welcome Mary’s act of hospitality and sit down at the kitchen table to dine on the cooked lamb, while Mary sits down in the living room. As the men happily engorge themselves on the sought-after murder weapon, Mary, in the other room, smirks quietly. 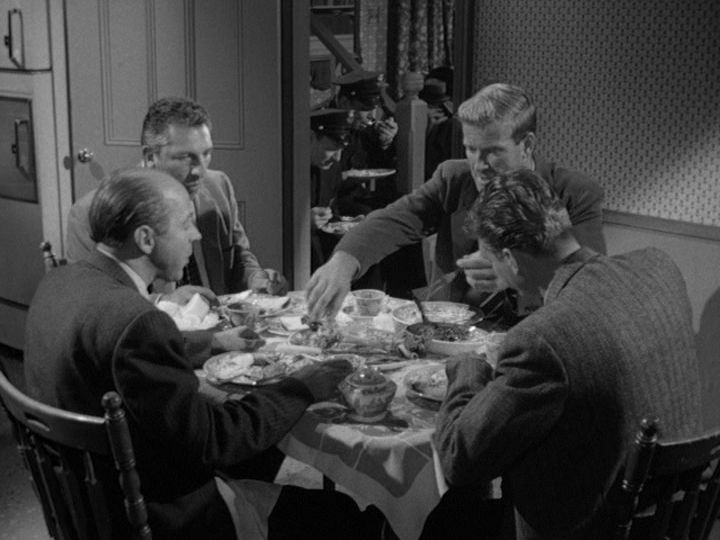 Hitchcock’s presentation of “Lamb to the Slaughter” follows the Dahl’s original story quite closely. As with many Hitchcockian tales, the objective mechanics of guilt attribution have had trouble dealing with the complexities of this world we live in. A key to the effectiveness of this episode, though, is Barbara Bel Geddes’s delicate performance. She subtly and naturally shifts the dramatic perspective from that of an innocent victim to one of an almost scheming perpetrator. In the end, Mary shows no remorse, only cynical relief. All along the way, the viewer shares her perspective and is likely to sympathize with her. The degree to which the viewer fully shares and is in tune with Mary’s closing smirk, however, may well depend on the viewer’s own feelings about justice. Where do you fall in this balance? Roald Dahl, “Lamb to the Slaughter”, Harper’s Magazine, (September 1953).